Making the world more awesome through tortoise cozies & bake sales. At our SXSW conversation a few weeks ago one thing we talked about a lot was that, for us, the best way to stay vegan & help animals is by doing things that make you happy. Protests and political actions are so important but it’s really easy to get burned out and they just aren’t for everybody. For me, I found that I like writing about awesome vegan food, rescuing dogs, and having bake sales. But there is a million other things you can do if you can just think of them. I saw this story this morning on The Mary Sue and I had to share. A woman named Katie Bradley got involved with tortoise rescue and rehabilitation and then realized she had the talent to crochet tortoise cozies and sell them on the Etsy to raise funds for International Reptile Rescue. So inspiring and so fun. I love it. Also, we need more bakers for the Austin World Wide Vegan Bake Sale coming up April 27, if you haven’t signed up yet, get to it! 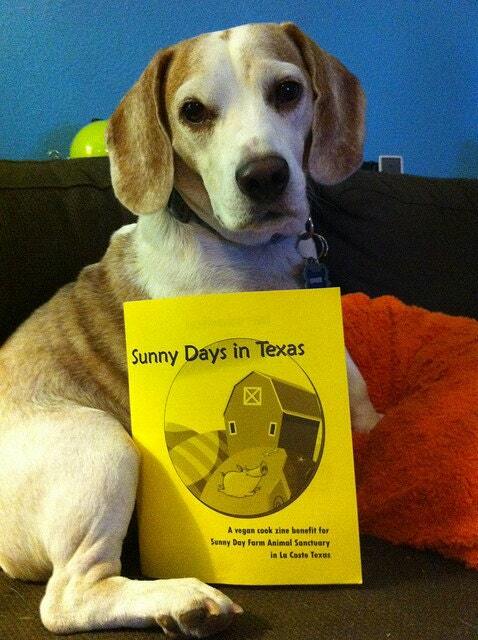 This entry was posted in animals and tagged activism, atxwwvbs, tortoise cozies on March 28, 2014 by lazysmurf. Recently it was cold and raining and the only thing in the world that I could imagine eating was a steaming hot bowl of noodle soup. 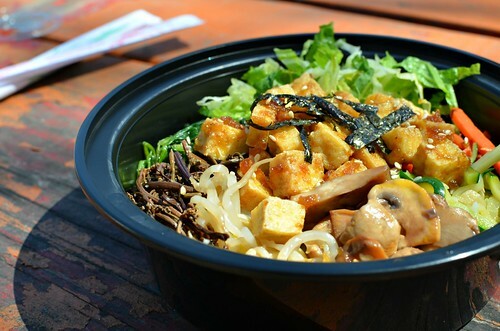 I’d seen a delicious looking noodle bowl on Busy Veggie Mama so we headed off into the labyrinth of big box stores that is the Muller Redevelopment in search of the strip mall we were looking for that houses the newest vegan friendly hand pulled noodle restaurant. Actually, as far as I know it’s the only vegan one in town but hopefully someone can correct me. I spoke with the managers and they told me that the white noodles are vegan most of the time but the green ones are always vegan. They also said they’d be adding more to the menu as time goes on. The interior of the restaurant is kind of tiny, very bright and clean without a lot of adornment. You can see the chefs pulling the noodles and there were tons of front-of-the-house staff making sure everyone was happy. 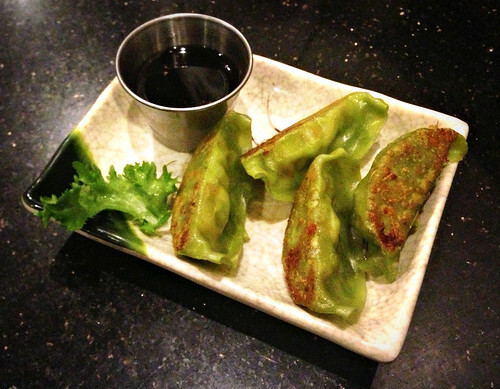 We started with the edamame dumpling which were actually my favorite part. 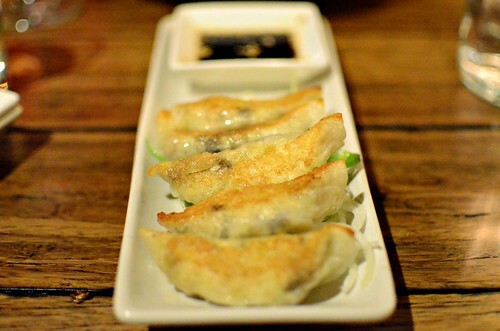 They were chock-full of edamame and the dumplings had a very nice smooth texture. For the soups the only veggie choice has a seaweed broth that is rounded out with tofu, asparagus, bell peppers, bamboo, and spinach. You also choose whichever noodle type that you fancy and they will make them fresh, there were the standard vermicelli. fettuccine, spaghetti, parpadelle, thick spagetti, and triangles. Of course when I saw the latter, I had to get triangle and my friends all laughed at me since I was disappointed when my noodles were not, in fact, little triangles. Laura said “what you think there is a guy back there with scissors cutting out every tiny triangle?” Yes. I did. Speaking of scissors, the menu says that you can request scissors to cut the noodles if you like. They also recommend eating your whole bowl in less than 5 minutes for optimum texture. My whole table took this as a challenge but none of us were able to make it because these are gigantic bowls. We all found the soup a little bland. Like, so bland that it would be the perfect thing to eat after a bout with the stomach flu, but when we added soy sauce and asked for their homemade chile sauce it was much better. I think it can be tough for people that rely on meat to develop good flavor in all veg soups so hopefully the broth will improve over time because the noodles were delicious. And I love noodles. 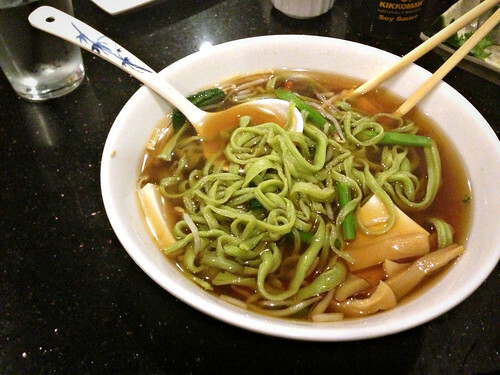 I even love the word: noodle. It’s good stuff. 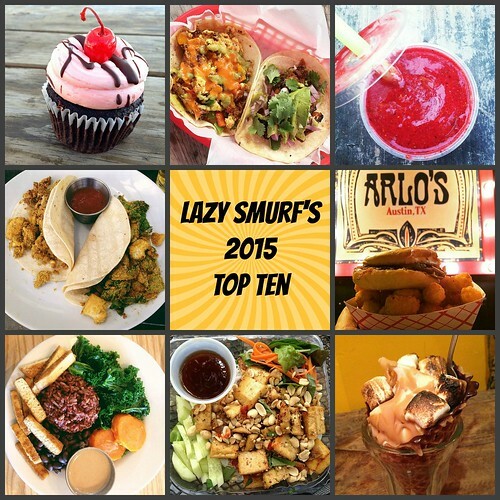 This entry was posted in Austin, Austin Restaurant Reviews and tagged #atxvegan, Austin, dumpling, edamame dumpling, Hand Pulled Noodles, noodle soup, noodles, vegan, vegetarian, Xian Sushi & Noodle on March 25, 2014 by lazysmurf. I became obsessed with Korean food during my last trip to Portland where I had one of the most amazing meal ever that included having three waiters making table side bibimbap, which I remember like a fever dream at this point. An amazing fever dream. 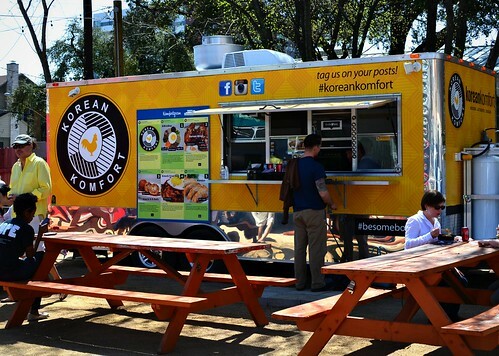 I had never had delicious traditional Korean vegan food in Austin (although I love those fusion tacos at Chi’lantro) so when I saw that a new trailer, Korean Komfort, was opening up that magical night at Departure came flooding back. 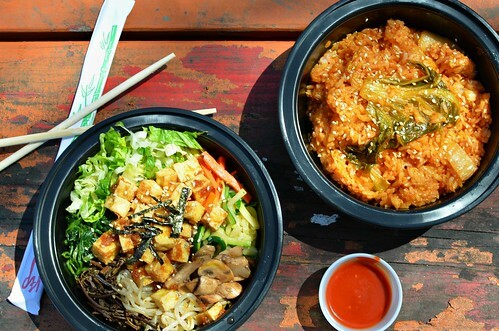 I chatted with one of the owners Min Choe and he assured me that both the bibimbap & the fried rice are vegan without the egg so I headed to the Rancho Rio Eatery trailer park on 25th & Rio Grande as fast as soon as I could. We came right at noon and I believe, for a while anyway, they will be open noon-9 during the week and then later on the weekends. Although there were a lot of students about on such a sunny day the trailer park had a range of folks. Spring time in Austin is just the best. I liked that their food was wrapped up in perfect containers to take back to the office for the other 300 days of the year when it’s blazing hot or threatening ice storms. The Korean fried rice was really tasty and had a good-sized portion for lunch. But, if I was going by myself I would stick with the bibimbap which hit those salty sweet notes of Korean really well. I loved it. All the ingredients seemed really fresh but were also prepared nicely & well seasoned. The fried tofu was crispy and everything went together really well with spicy side of sauce. I learned that Min’s wife grew up and Korea and is the mastermind behind most of the dishes, preparing kimchi every day and making sure that all the dishes come out the way they are supposed to. I think it’s a great addition to the trailer food scene and I’m happy it’s close enough to downtown. 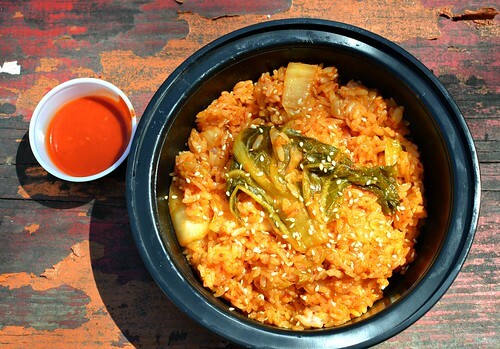 Check it out if you love Korean food! 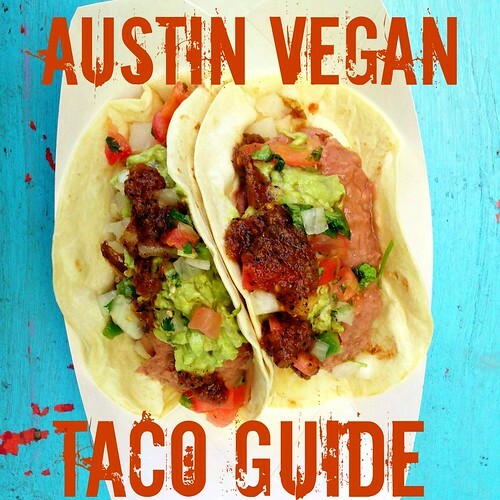 This entry was posted in Austin, Austin Restaurant Reviews and tagged #atxvegan, Austin, korean, Korean Komfort, trailer, vegan, vegetarian, West Campus on March 21, 2014 by lazysmurf. 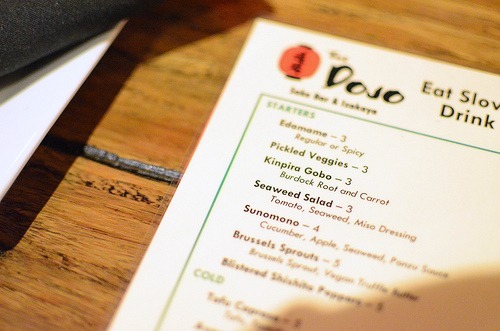 I’ve been hearing about The Dojo, a new Japanese Bar & Izakaya (small plates) in North Austin for a couple of months now, when Sue at Counter Culture told me it was one of her favorite spots I knew I had to go stat. I was excited to finally try it last week. For some reason I was expecting it to be on the fancier side like Uchi & Uchiko, where I usually go for sushi, and was surprised to find it stuck between a Chilies and a Trudy’s in a strip mall on Burnet & 183 with a bar in the middle and plastic menus. They did a really nice job with the location, though, making it very welcoming with lots of wood beams and different spots for seating. 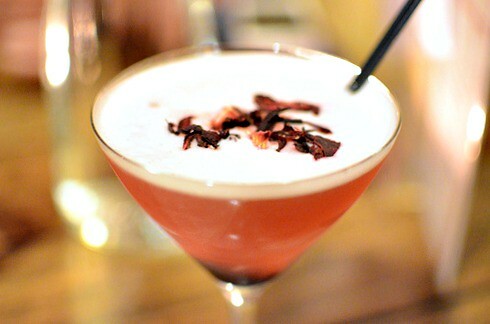 I was excited that they had separate vegan menus (and gluten free) and of course, an elaborate drink menu with sake cocktails and lists of beer, wine and cocktails. I think I got the Rising Sun which had Orange Sake, Orange Schnapps, Grand Marnier, Agave, Fresh Orange and Strawberries and reminded my of orange strawberry shakeup from the state fair. It was very sweet and frothy. 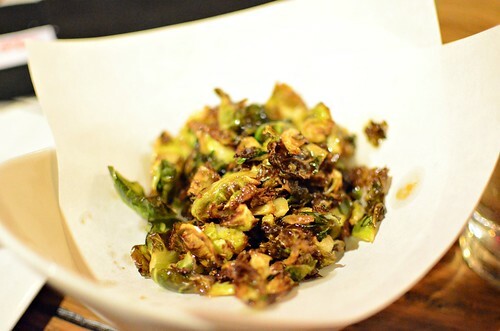 The first menu item we tried were the Brussels with truffle butter (vegan style) and they were delicious although they were also swimming in oil and we couldn’t even eat them all the way to the bottom. I love that Brussels Sprouts have become so popular in the last couple years. It would have been smarter for us at this point to order something off the cold menu like the Tofu Caprese (Tofu, Tomato, Avocado Moussee, Shiso, Balsamic Pearl) or the Avocado and Crispy Tofu Salad but instead we went with more fried food. 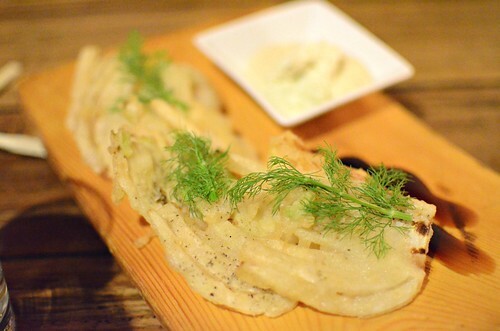 We tried the special with fried fennel. 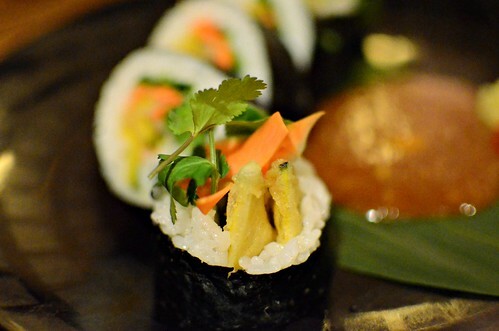 and Fuyu Maki Sushi which had winter squash tempura, cilantro, onion, carrot, and spicy miso. I think the sushi roll was my favorite part, I really like the spicy miso sauce. 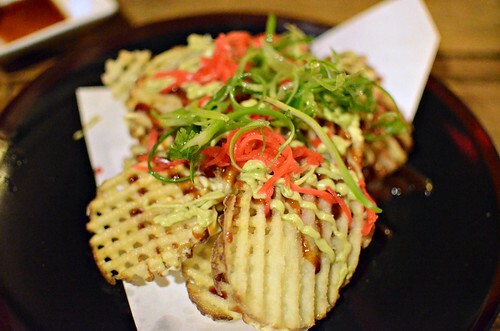 We also got the Okonomiyaki Style Fried Potato which seemed more like Japanese waffle fries than Okonomiyaki to me. The fries were perfectly done and super crunchy. 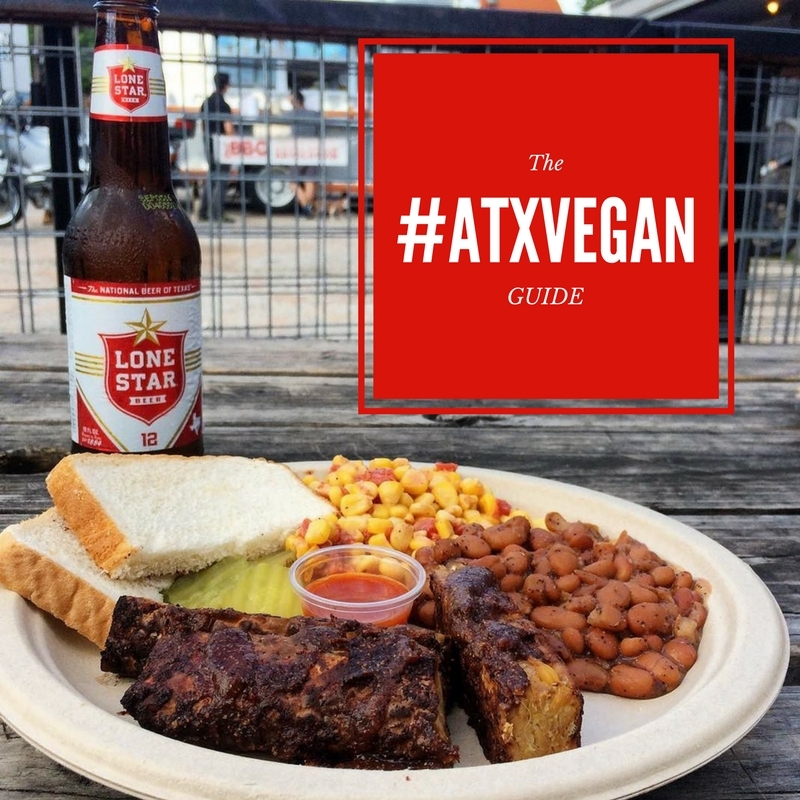 Judging from the #atxvegan tag on instagram this seems like the most popular dish there and the most fun. It wasn’t for me because I think there must have been mustard in the sauce which I do not eat. We also tried the ramen and the udon noodles but I was so full at this point I stopped taking pictures! I know that Molly loves the ramen but I decided I must not be a ramen fan because I haven’t been too impressed by any that I’ve had in town yet. I’ll have to try some next time I go to the west coast. 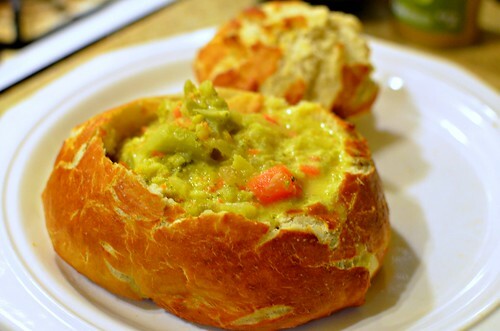 Or the recipe in Vegan Eats World. Finally we got the dessert which, I didn’t photograph because it was melty when it came out, but it was WITHOUT A DOUBT my favorite part. “The Dojo Parfait” had ice cream, strawberries, mochi tempura, red beans, and pocky. I loved the pockets of fried mochi mixed with the coconut ice cream. It was like the fried ice cream I used to have at Mexican places in my hometown when I was a kid. I think the Dojo will be a great addition to the neighborhood. How nice for vegans to finally have a bar that has tons of options for every kind of eater (there were some macro and lots of GF options in addition to all the fried stuff I had) which are all under-served in that area of town. I think they have been having a lot of settling in issues because the menu has gone through quite a few changes since they opened. 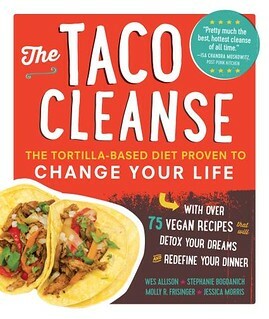 Hopefully, they will tighten things up and continue to have a lot of success with the vegan community! 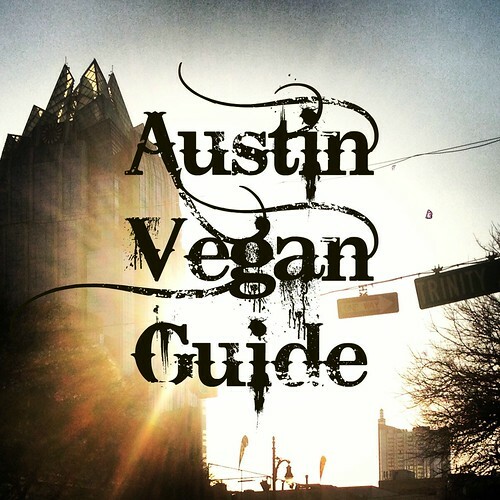 This entry was posted in Austin, Austin Restaurant Reviews and tagged #atxvegan, Austin, austin vegan restaurant, Japanese, Japanese Bar, North Austin, The Dojo, vegan, vegetarian on March 19, 2014 by lazysmurf.